The IDS-305F is a 5 port Managed Ethernet Switch that can operate in industrial environments providing advanced performance and enabling real-time deterministic network operation. Four 10/100/1000-Base-T Ethernet ports are available for networking Gigabit and Fast Ethernet devices. One 100Base-X fiber connection is available to extend Fast Ethernet operating distances over fiber. In industrial plants, where high levels of electromagnetic interference ( EMI ) is a common phenomenon, utilizing fiber is critical. EMI can cause data corruption over copper-based Ethernet links. However, data transmitted over fiber optic cable is completely immune to this type of noise ensuring optimal data transmission across the plant floor. 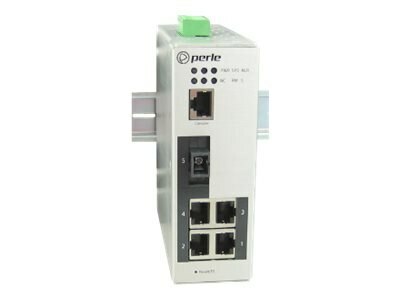 Perle Industrial-grade Ethernet Switches are designed to stand up to extreme temperatures, surges, vibrations, and shocks found in industrial automation, government, military, oil and gas, mining and outdoor applications.